How do we build a healthier, happier community? 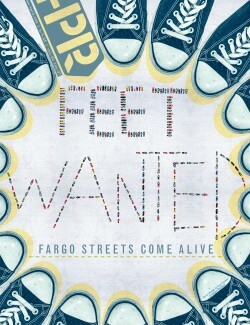 Finding an answer to that question is the “high-level” purpose behind Fargo-Moorhead’s annual StreetsAlive! events. The other, perhaps simpler purpose? Giving people a good reason to get outside and have fun. StreetsAlive! will be held three days this summer – June 14, July 12 and August 30 – and its premise is pretty straightforward: close off a three-mile loop of city streets in Fargo-Moorhead from motorized traffic and open it up to the public. That’s when things get interesting. Runners, walkers, cyclists, rollerbladers and skateboarders have all shown up in past years. But all means of non-motorized movement are accepted. Dance down the streets if you feel like it. Hula hoop your way through. Dust off that old Razor scooter, if you can find it buried in your parents’ garage. Barrel roll? The event is designed to coax people to get outside and move -- by any means possible -- within the three mile zone. There aren’t any start or finish points – people can jump in, and jump out, anywhere. Throughout the course, there will be many activities and demonstrations. “The hope is to get people to take to the streets like they may not normally do,” event founder Rory Beil said. “Hopefully we can create a culture where movement and activity is inherent in daily life, and to get people used to this idea and normalize it. Sara Watson Curry, an organizer of StreetsAlive! and director of Great Rides Fargo, noted that StreetsAlive! is geared to introducing people to new experiences and, hopefully, new habits. And, as Beil and Watson Curry both stressed, StreetsAlive! is about having fun. The High Plains Reader has compiled a guide of this year’s StreetsAlive! activities to help you plan your day out. New activities will likely be added closer to the actual event dates. In addition to the action along the course, there will be two major congregation points, Activity Alley and Participation Parkway. Bike Rodeo (1 to 3 p.m. during the June and July events) will be an obstacle course that teaches bicycle safety skills and includes a bike safety inspection and helmet giveaway. Group fitness classes will be open for participants to jump in and try out. If you’ve ever wondered what it would be like to participate in a Zumba or Tabata class, or just what a Zumba or Tabata class actually is, this would be the time to find out. Besides Activity Alley and Participation Parkway, several noteworthy, stand-alone events can be expected along the course. A special presentation awarding the F-M metro area the Bronze Medal for Bicycle Friendly Community, a certification from the League of American Bicyclists. The presentation will take place on the NP Avenue Bridge at 3:30 p.m.
Food by Smiling Moose Deli, GiGi’s Ice Lollies, Luchadores Taqueria and Nibblers. Kids will be selling reasonably-priced, dietitian-approved food to encourage healthy eating. Sundays, June 14, July 12 and August 30, from 12-5 p.m.